New range of acrylic paint Spray Amsterdam-based paint suitable for indoor water. Its wide range of 46 colors is ideal for combining with other acrylic paints Amsterdam. Bright, waterproof (once dry) and high resistance to light, colours can be used on many surfaces ... Now with acrylic paint sprays, yes you can do it! Acrylic spray Primary Cyan Blue 572 Amsterdam 400 ml. Acrylic Spray Raw Sienna 234 Amsterdam 400 ml. Acrylic spray Permanent Dark Green 619 Amsterdam 400 ml. 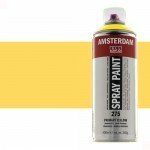 Acrylic Spray Primary Yellow 275 Amsterdam 400 ml. Acrylic spray Neutral Grey 710 Amsterdam 400 ml. Acrylic Spray Carmine 318 Amsterdam 400 ml. Acrylic spray Dark Gold 803 Amsterdam 400 ml. Acrylic Spray Reflex Pink 384 Amsterdam 400 ml. Acrylic spray Ultramarine Violet Blue 507 Amsterdam 400 ml. Acrylic spray Shiny Blue 564 Amsterdam 400 ml. Acrylic Spray Dark Naples Yellow 223 Amsterdam 400 ml. Acrylic Spray Lemon Azo Yellow 267 Amsterdam 400 ml. Acrylic spray Turquoise Green 661 Amsterdam 400 ml. 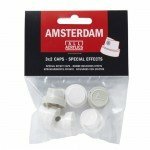 Acrylic Spray Red 311 Amsterdam 400 ml. Acrylic spray Silver 800 Amsterdam 400 ml. 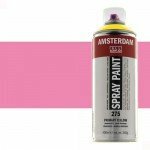 Acrylic Spray Primary Magenta 369 Amsterdam 400 ml. Acrylic spray Dark Sienna 411 Amsterdam 400 ml. Acrylic spray Light Sky Blue 551 Amsterdam 400 ml. Acrylic spray Primary Veronese green 615 Amsterdam 400 ml. Acrylic Spray Reflex Yellow 256 Amsterdam 400 ml. Acrylic spray Light Olive Green 621 Amsterdam 400 ml. Acrylic Spray Azo Orange 276 Amsterdam 400 ml.